We have been to the Cape of Disappointment. And we have prevailed. Tuesday morning, we learned two things: weather at the Cape had been spectacular on Monday, much better than had been forecast, and the weather was a bit marginal for Tuesday. By mid-morning, further satellite pictures had scrubbed our flight for the day. Or so we thought. Another group working in the area gave it a try at a glacier valley about 25 miles southwest of the Cape, and got in. After a couple of visits to their instruments, they realized that they could use some spare components that they did not have. I was sitting at my desk, typing. 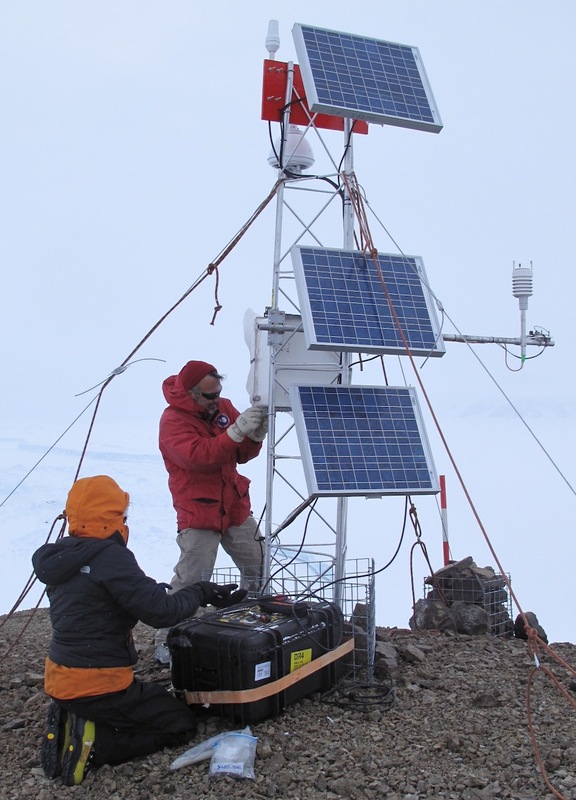 Handheld radios are everywhere in Rothera, so one hears snippets of conversations all over the place. I am not paying much attention to this background noise, when I notice they are talking about me. No, not a paranoid suspicion (this time), they really were. “Well if we could get Ted Scambos up to the control tower we might be able to resolve this quickly.” The verbal equivalent of the Batman signal flashing in the sky! I ran up the control tower stairs two at a time, and burst into the room at the top, breathless but at the same time trying to be nonchalant. “You know you’re going out to Cape Disappointment to deliver them, right?” Batman light reformed. “And you’ll need to round up your gear. Tamsin and Malcolm are on their way from the skiway to help you install that camera.” Batman light burned brightly now. It took us until 5:30 pm to get to the area of the Cape. 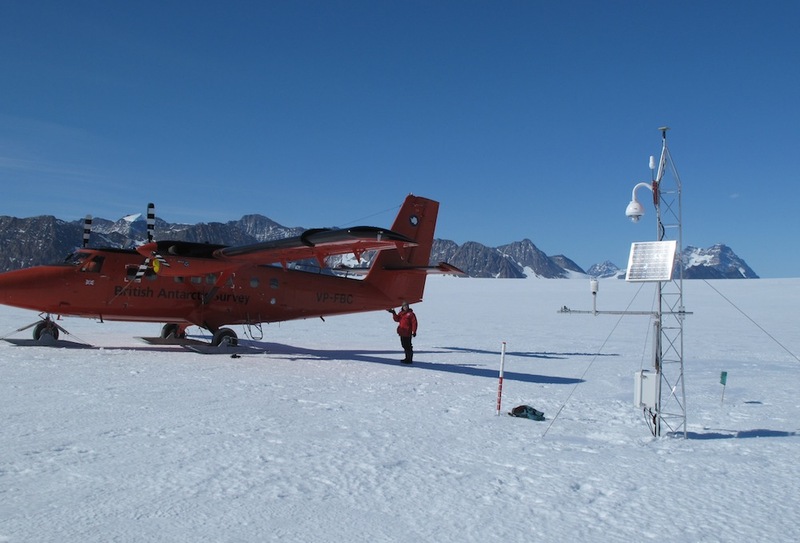 And, the weather: the other Twin Otter with Hilmar Gudmundsson had landed earlier, when the weather was acceptable. They set out a line of flags in the snow. Cape Disappointment is no airstrip. 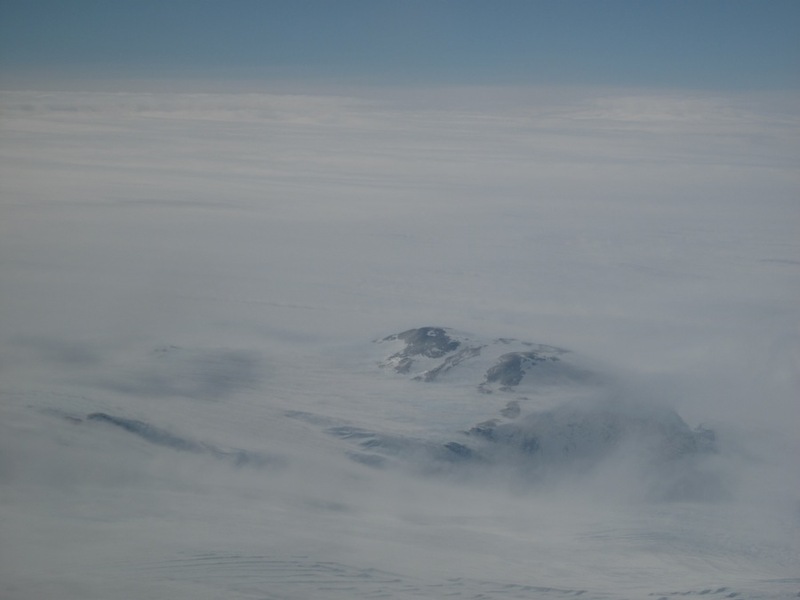 The ice cap (see pictures from last blog) is quite lumpy. And now a layer of heavy clouds had moved in, cutting off the light and making everything flat: no contrast, like a white-out. But Doug, our pilot, plopped the plane down like a ski jumper sticking the landing at the Olympics, and skidded to a stop. We taxied up to the other Otter. The other pilot, Steve, explained, “The weather has been declining all day. When we landed at 2, it was great.” We learned that the stuff we brought out won’t even be of use. It was the right stuff, but it was now a bit too cloudy and murky to try any more new landing sites for the day. By now the clouds were fairly heavy over us, and a light snow had begun. 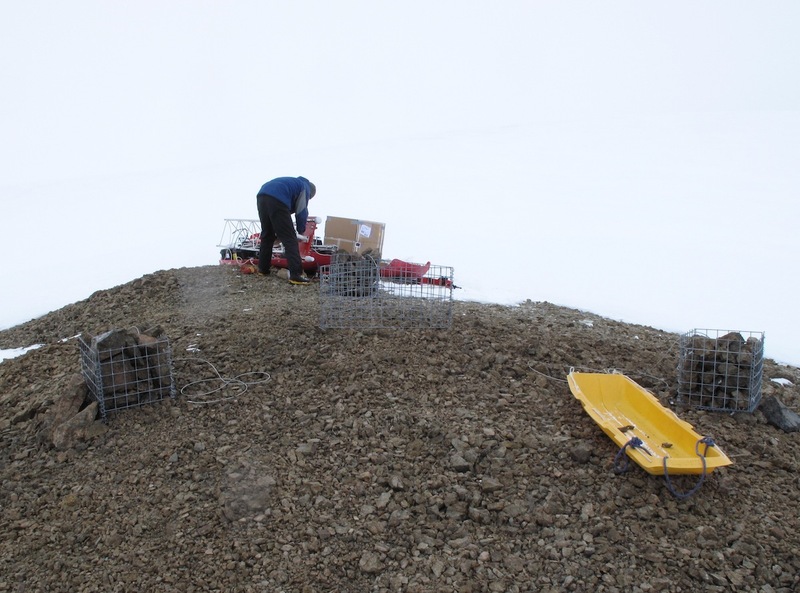 But we set out with the gear on the sleds for the rock outcrop. A hill of ice obstructed our view, and I couldn’t even tell if we’d be able to see Scar Inlet Shelf from here. 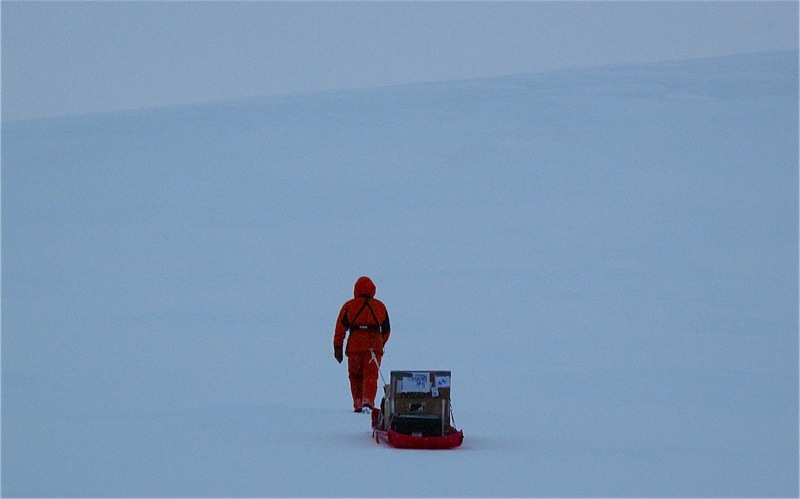 We spotted the outcrop just a few hundred yards away as we rounded an icy knoll, and dragged the sleds with the gear over to it. The rock was shattered from freeze-thaw, so we couldn’t use the rock-bolts; but Malcolm had made wire baskets that we filled with rocks to attach the guy wires too. It went like clockwork. Everything fitted, we had parts for everything, the batteries were charged, and we moved in a very efficient sequence. Step by step. The tower went up. Got secured. Solar panels bolted on. Sensor boom mounted. Main camera mounted. Camera direction looked good. Baskets filled with rocks. Guy wires tightened. I got out the laptop to poke around the inside of the mind of AMIGOS6. And it wouldn’t boot up. The battery was dead, or too cold. I warmed it up for 20 minutes against my stomach, but it still wouldn’t boot up the computer. Wow. Now we had some gambling going on. It is now snowing and about 15 degrees Fahrenheit. Cold and dark, and 9:45 pm with hours to go. OK. We have to gamble that it is all good. The plane was loaded, but the weather was marginal. There was sort of a fuzzy horizon, one could sort of see the ice shelf a distance away, but it was more like being inside a light bulb. Diffuse. We taxied to the end of the flag line, and Doug was thinking hard, looking around, going through possibilities, contingencies. We could see the eight flags, yes. But it looked like they were painted on a featureless grey screen, just poles in space. We knew there was a drop-off in front out there somewhere. And a cliff, and mountains to the west. But Twin Otters are amazing, short take-off, tough as nails, and climb like an elevator. Light snow begins to accumulate on the windscreen. Doug ponders. Close your eyes and floor it. Cape Disappointment AMIGOS-6 is working perfectly. All the pictures are pointing right where we hoped they would, and the weather station, GPS, and solar sensor have sent data hourly. The Nikon is showing scenes from the front of the shelf, and already it’s clear that there has been some evolution in the past few weeks/months, relative to satellite images. A total success. This photo was taken from the camera on the new AMIGOS station. Both Twin Otter aircraft wait at Cape Disappointment. A view of the final Cape Disappointment AMIGOS tower near the end of assembly. 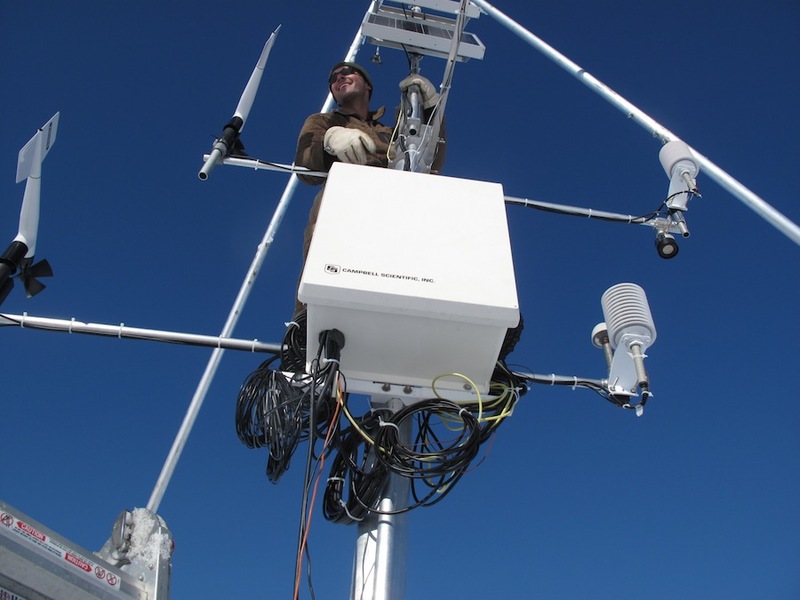 Ted works on the main box with the camera system, on the Cape Disappointment AMIGOS station. 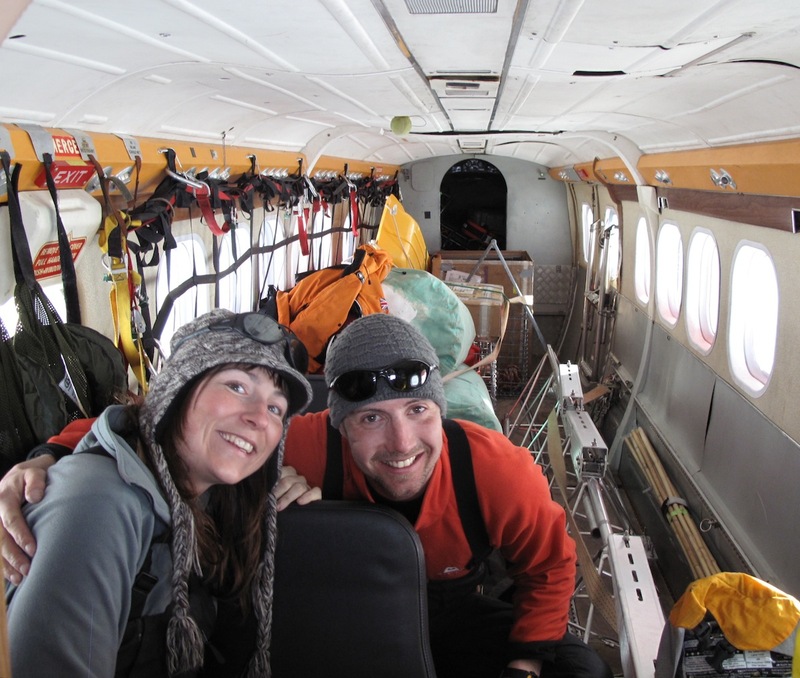 Tamsin Grey and Malcolm Airey in the back of the Twin Otter en route to Cape Disappointment. 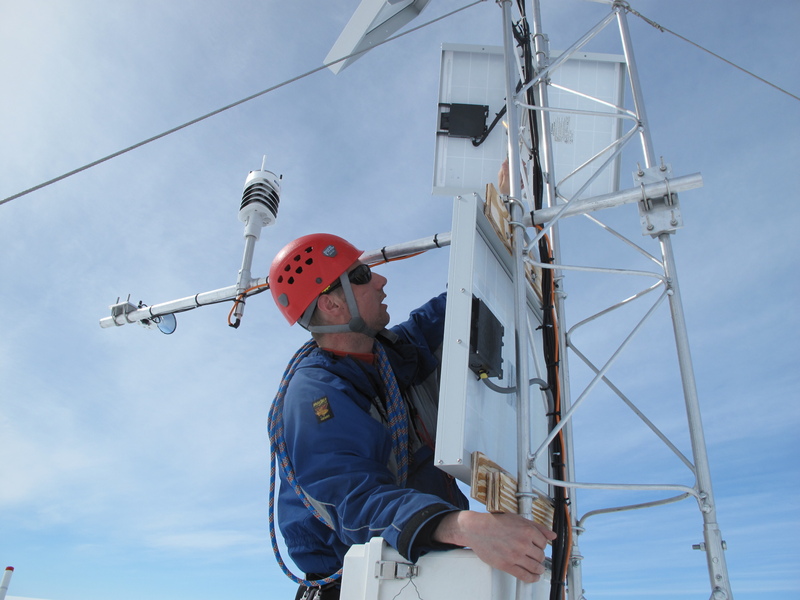 Malcolm Airey assembles the upper GPS sensors and iridium antenna on the tower. The site of the AMIGOS-6 camera is shifted a few hundred yards from where we planned because of where the planes landed and a less even slope across the back of the foreground cliff face. Both Twin Otters landed just above the red dot, and took over from the small ice cap towards the cliff, lifting off well before the cliff face. The Cape_Disappointment AMIGOS6 camera system. Pilot Doug Cochran walks back to the plane to begin to re-pack it. 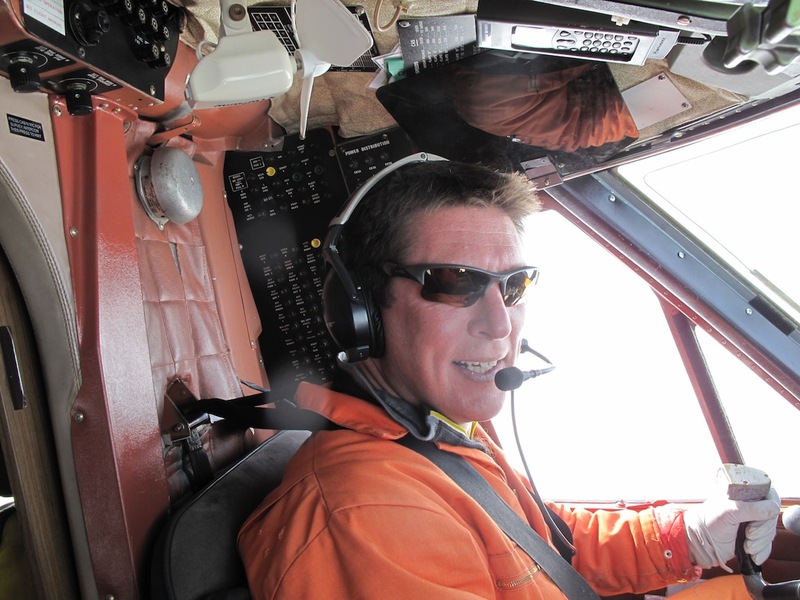 On Friday, I took a quick tour of several sites near the Larsen C and B area with a British Antarctic Survey (BAS)-supported team including pilot Doug Cochran, general assistant Malcolm Airey, Frazier (sightseeing weather forecaster). 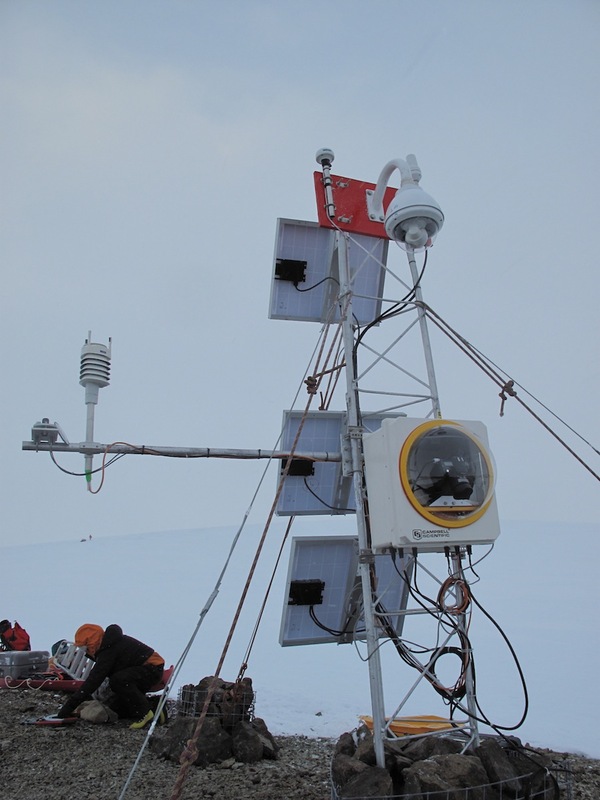 The main goal of the trip was to repair a precision GPS station. 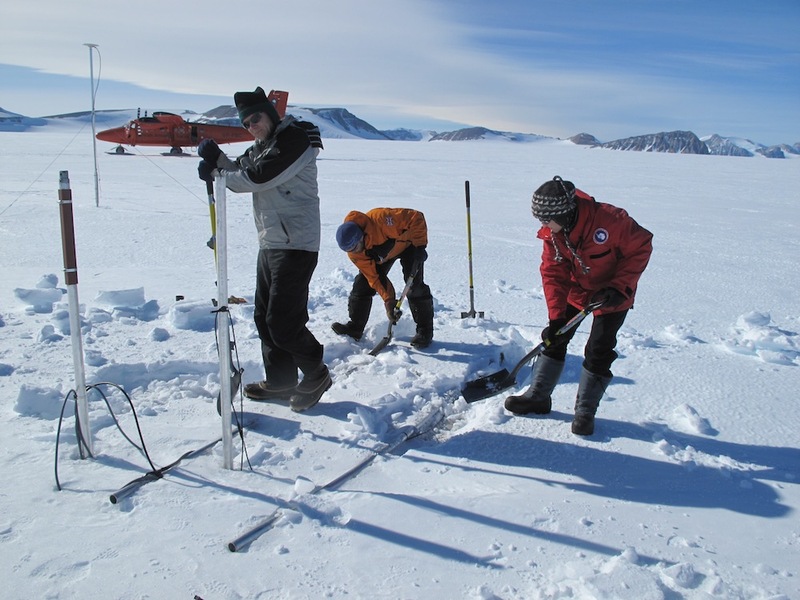 The station measures rock uplift in the Larsen B region as a way of modeling both the past and present ice loss. For a change of pace, let me tell the story as picture captions. (All photos are courtesy Ted Scambos). 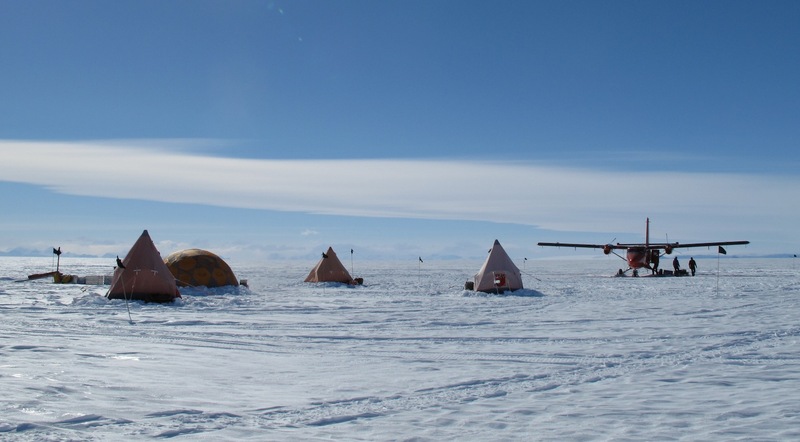 Yankee Camp basks in the sunshine of northern Larsen C Ice Shelf. 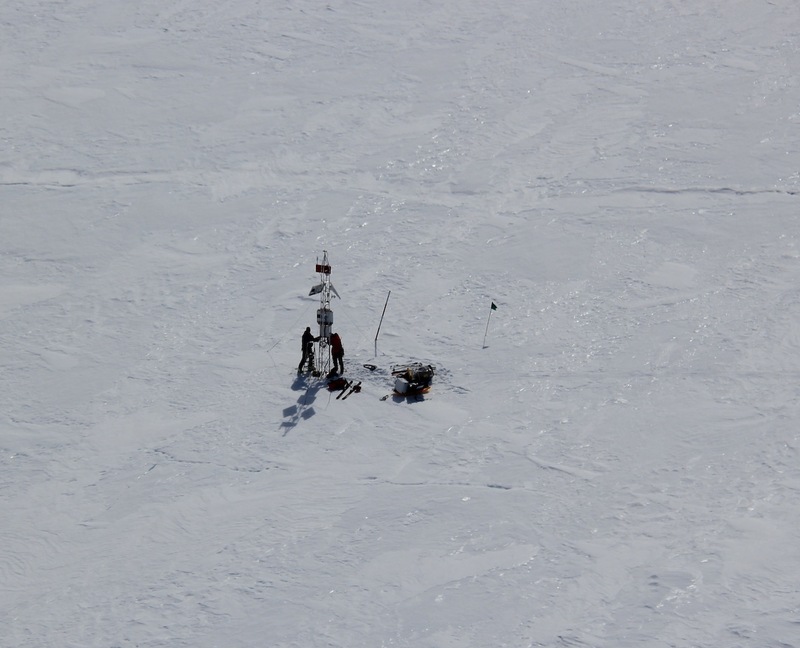 This is CIRES Director Koni Steffen and graduate student Dan McGrath's base for their radar surveys, which range out to 100 kilometers from this site. The Brits gave it the name, tongue in cheek. The funny thing is, Dan is the only American-born person there. We have stopped to drop off two fuel drums for the surveys. Dan and Tom (a BAS general assistant) are out surveying. 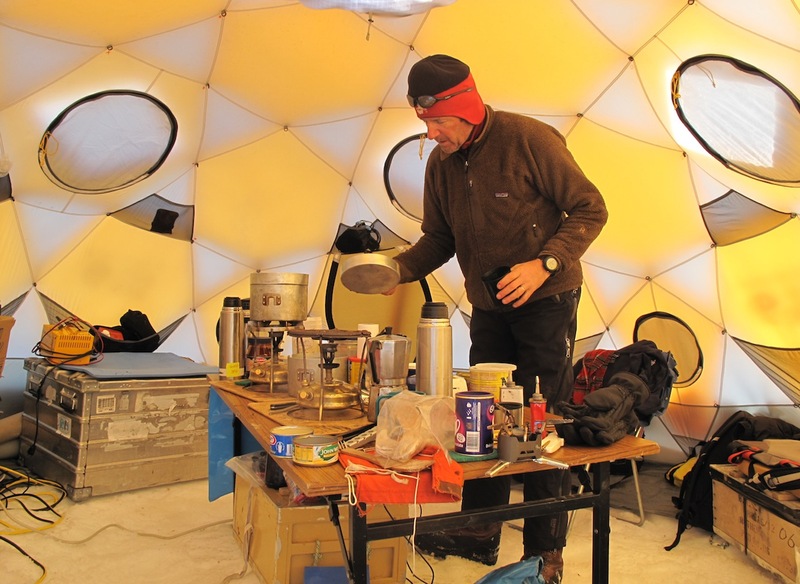 Chilean glaciologist Dr. Gino Casassa prepares coffee for a visitor inside the main tent at Yankee Camp. Koni brought two (yes, two) Nespresso machines to Camp Yankee. One is an emergency back-up, says Koni. A Pepperidge Farm Chessman butter cookie was also offered (and munched). The net value of that single cookie, delivered here on the Larsen C Ice Shelf, is probably on the order of $2. Thanks. 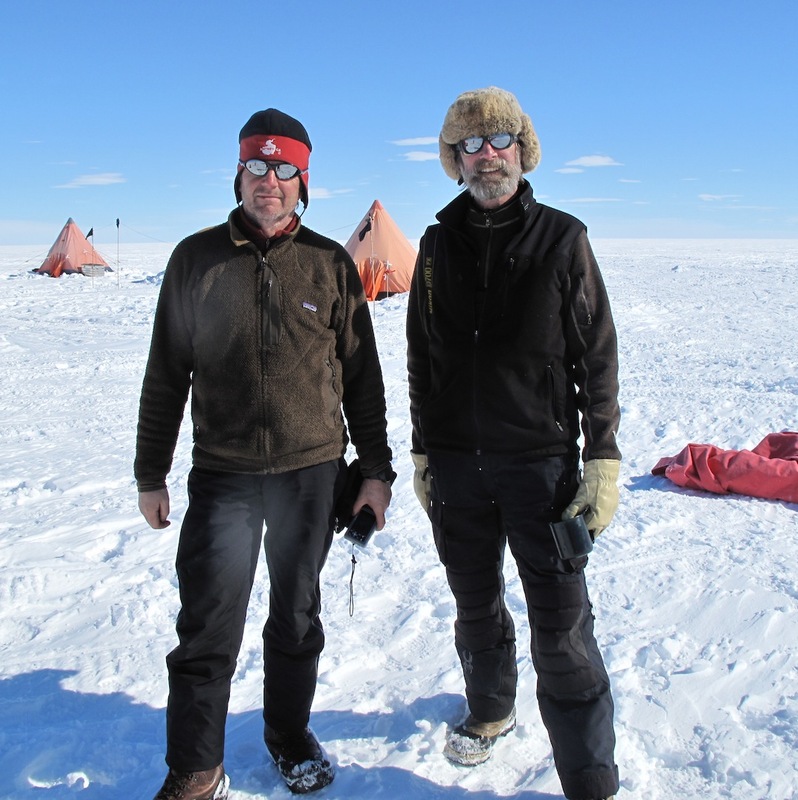 Gino and Koni Steffen enjoy a very pleasant day on the Larsen C Ice Shelf. Large cracks line the northeastern edge of the Larsen C Ice Shelf. These are quite typical of ice shelves, and not an indication of change or warming by themselves. We are en route to Cape Framnes. 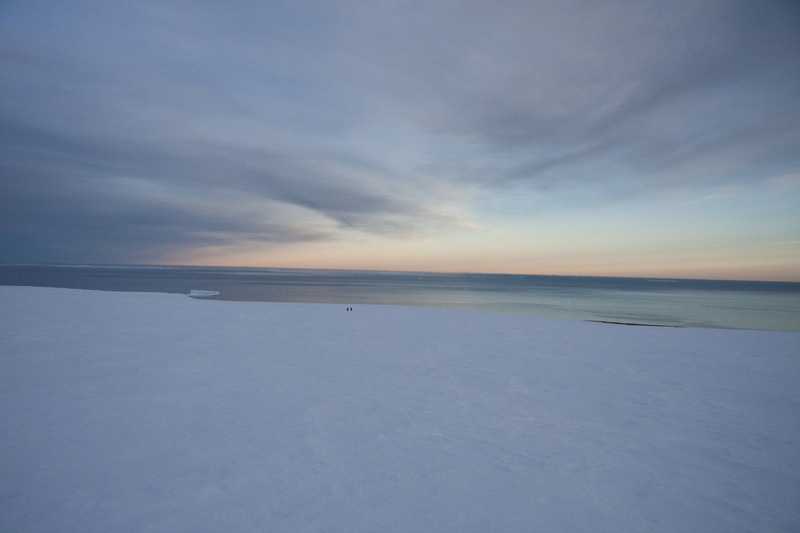 In the distance there is a large shore lead of open water, then sea ice at the horizon. This photo looks north across the Larsen B Embayment, to an area of open water and sea ice that was once covered by thick shelf ice. Jason Peninsula is an ice-covered ridge of land with small flat rocky outcrops. The CAPF GPS station is located at the far side of the brownish half-moon-outcrop area. Note the bluish patches of wind-swept ablating ice on the flanks of the ice sheet. The sea to the right of the outcrop showed us that the wind was quite high, with whitecaps blowing off the tops of the waves. Malcolm Airey unloads gear in a stiff wind, preparing for a short ski run down a hill to the Cape Framnes outcrop, while Ted watches idly. Doug Cochran landed the plane on a shallow uphill slope, that flattened just at the end of the landing run. Winds gusted to twenty to thirty knots during our stop. Later, for take off, Doug turned the plane around and took it back over the slope break, downhill and downwind. With the wind at our back, we were doing 70 to 80 miles per hour over the surface before lifting off, heading rapidly for the outcrop we had just climbed away from. Finally the wings gathered air underneath them and lifted us away. It rivaled the Palmer Station landing of last year. 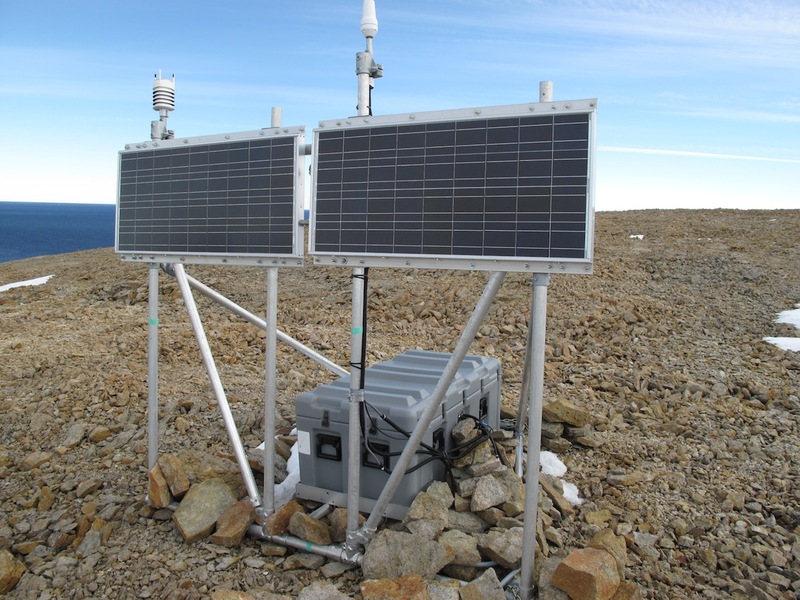 The Cape Framnes GPS station had an electronics problem and required several new components. 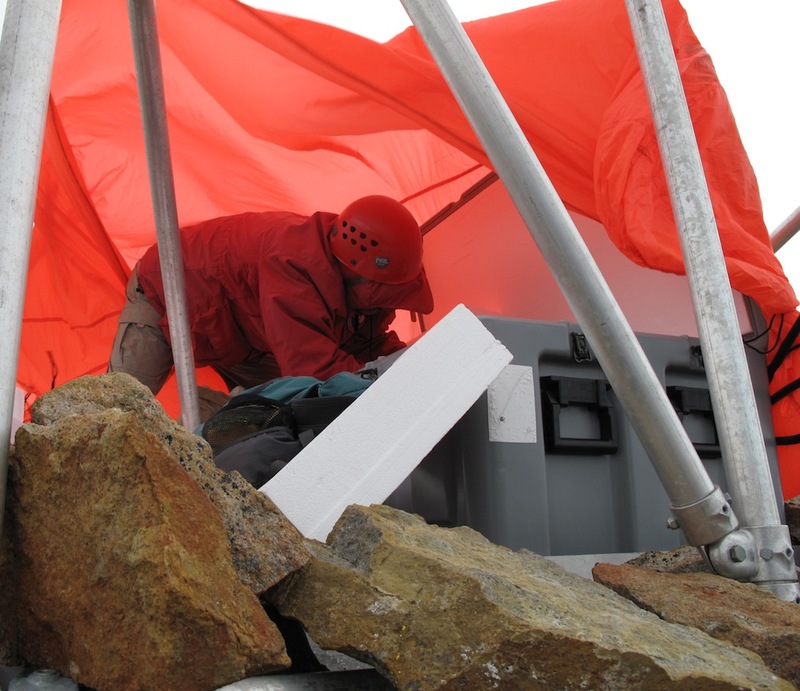 With winds gusting to 25 knots, Malcolm strung an orange tarp to try to shield us from the chilly blast. It was partially effective. A bit like hiding beneath a summer dress during a hurricane. 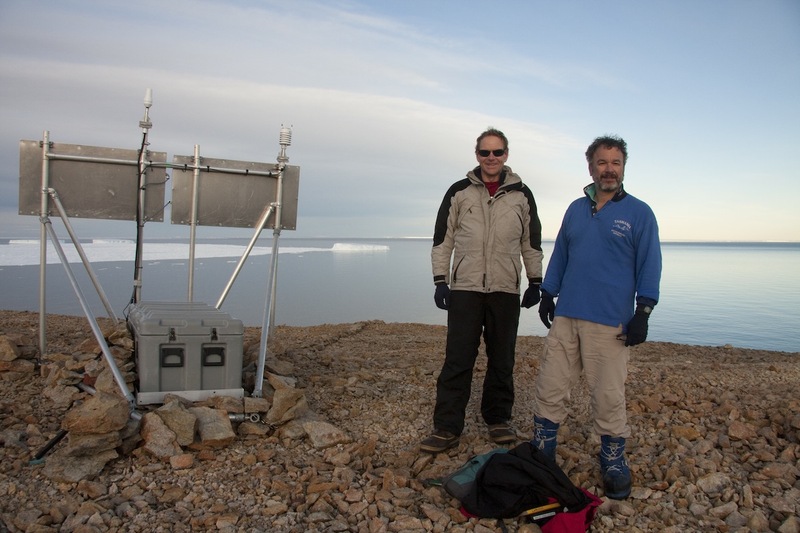 Malcom and Ted repair the GPS system. It was a success. "What do you mean, I have to drag the sled back??" After a thrilling take off, we next flew to Cape Disappointment for a recon of the planned last AMIGOS site. Cape Dis extends eastward from the Larsen B coast, essentially marking the boundary between the disintegrated portion of the Larsen B (behind the cape in this view) and Scar Inlet. Our favored site for the AMIGOS is the left-hand cliff in the image. Between the foreground Cape peninsula and the mountain ridge is the Crane Glacier embayment, formerly the outflow of Crane Glacier, but now covered by sea ice. At the far left, behind Cape Dis, is Exasperation Inlet, and the small rocky knoll across the Inlet is Delusion Point. Somebody was really having a bad day. This cliff is where we hope to set up the AMIGOS tower. I've marked the preferred site with a red dot, just above a break in slope that will give the camera an excellent view. The pilot thought a landing very near the outcrop was feasible. 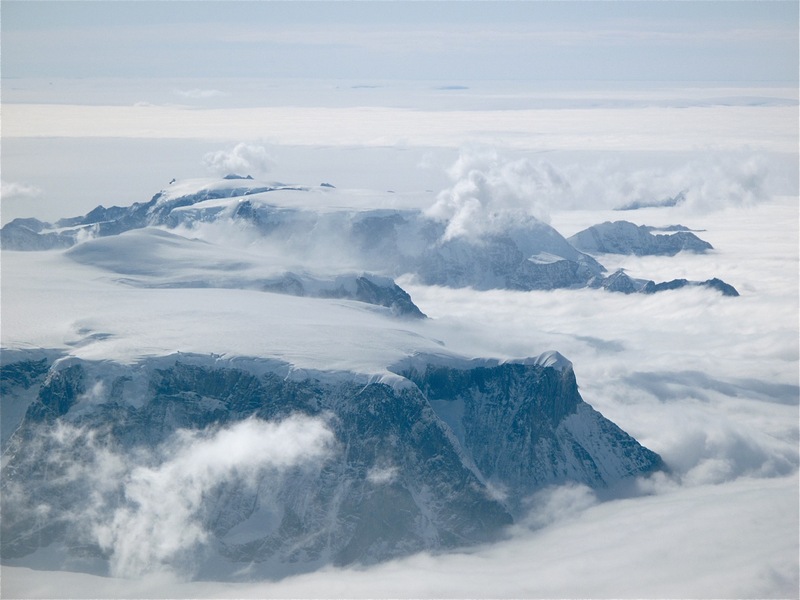 The mountains of the Antarctic Peninsula peek through the clouds. Photo courtesy Ted Scambos. 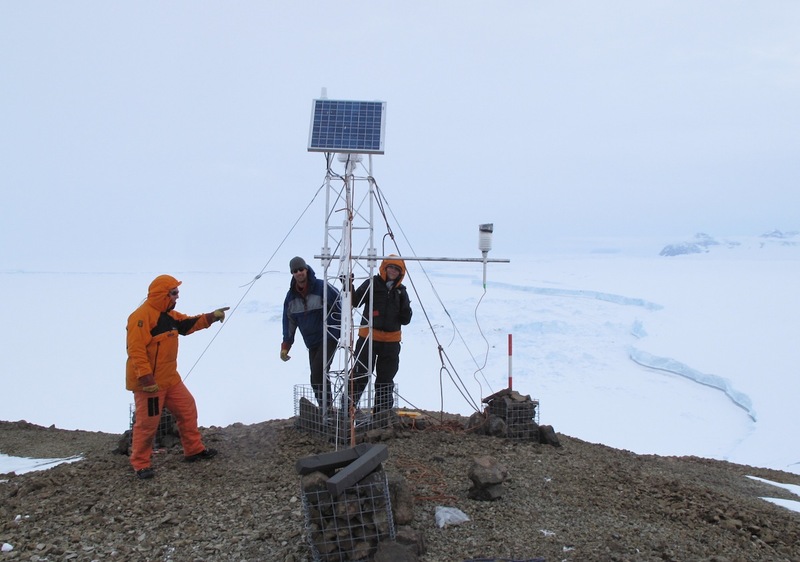 As mentioned, this year’s expedition is all about repairing existing stations and setting up one new one; yesterday we completed the first of these repair missions. The site in question is arguably at the eye of the storm for ice shelf break-up, near the center of the Scar Inlet Ice Shelf, a remnant of the Larsen B ice shelf that disintegrated in 2002. 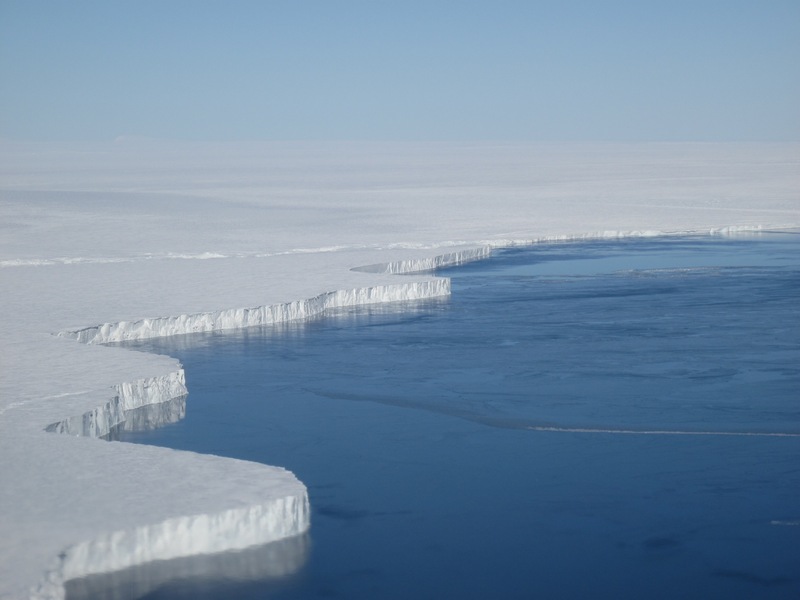 Since the 2002 break-up, this shelf has calved at least three major icebergs, developed several huge cracks, and has sped up, as the obstruction of the Larsen B ice shelf plate was removed. 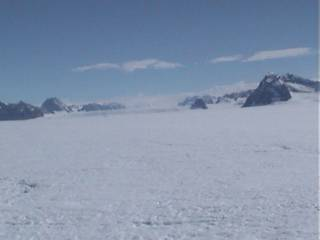 Behind it, dammed up by the Scar shelf, lie two very large glaciers, Flask and Leppard. The idea for this part of the LARISSA venture is to set up a series of stations to record the events leading up to the next break-up. If it happens, the Scar Inlet site is going to be a very exciting place. Briefly. The weather window to do the work yesterday was rather short. An intense storm gathered offshore of Rothera, with contour lines of pressure resembling a large dirty fingerprint on the map. Already as we were taking off, the wind coming off the ocean was brisk, and from the ground I could see dark chunky clouds skulking around the nearby ridges, spoiling for a fight. But from up above, as always, it was spectacular. It is the undersides of clouds that are fearsome. The upper sides are glorious, and in Antarctica you have a sun-splashed pallet of azure blue, wispy and sculptured white, ethereal cyan, and impossibly sharp black-brown, as sky, cloud, windswept or fractured ice, and rock form an ever-changing composition. A moonscape dressed in lace.The Antarctic Peninsula will someday be a world park of some kind, I am sure of it. It is breathtaking, and beautiful, and dynamic, and solemn all at once. We flew past both the Larsen C and Larsen B ice shelves. Koni Steffen (a.k.a. 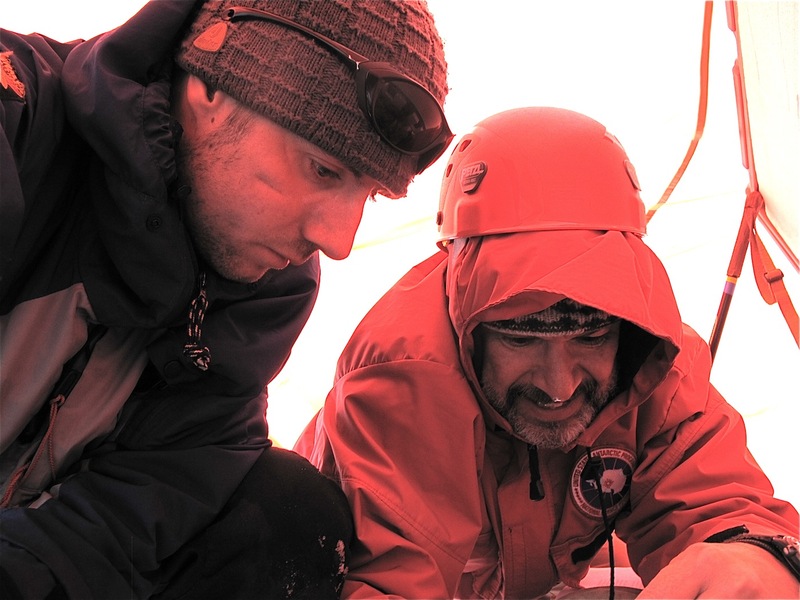 Fearless Leader, and both words apply fully), graduate student Dan McGrath, and Chilean scientist Gino Casassa are now camped on the Larsen C, surveying the ice there at an earlier stage of response to climate change (the Larsen C is south of the Larsen B, and slightly cooler). The Larsen B is closer to the point of destruction, and you can tell just by looking at it. I mentioned the huge cracks already, and there are massive crevasse trains where the large glaciers emerge from the mountains. But it’s more than that: the entire central shelf is a fine network of narrow fissures and slots, and in warm summers the entire area is covered with shallow melt ponds. The last intense melt season was 2006. If that season happened now, with the additional cracks and faster flow, I think we would see a disintegration. Our pilot, Doug Cochran, flew several circles around our station; it was surrounded by these narrow spiderweb cracks. 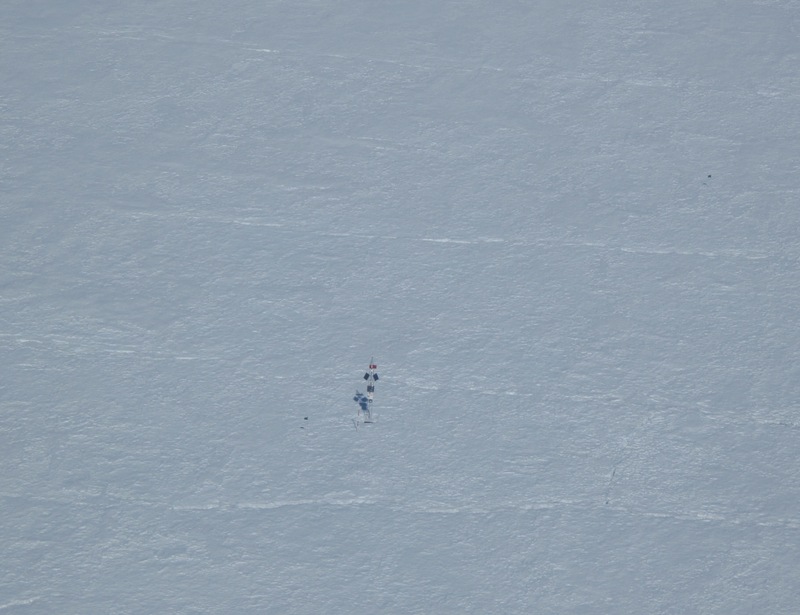 Last year, with less snow and more early melting, it was impossible to land here. Exposed cracks were everywhere. This year, the crevasses were still covered by icy spring snow. Eventually we gambled on one path, right along a flag line that we had installed when we first put in the station, in early 2010. It worked. Malcolm Airey,a BAS general field hand, and an expert climber and outdoorsman and I skied 300 yards to the site, roped and loaded with “jingly-janglies” (the UK slang for climbing gear: they say this phrase with complete British seriousness). 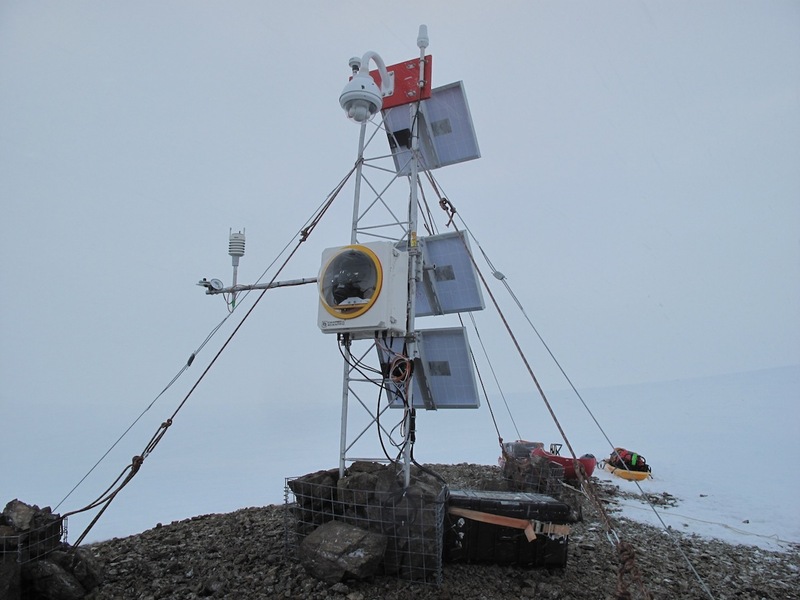 We replaced the weather station and the main processing box including a much better communications system for getting the data off in a hurry, and we were done: 90 minutes. 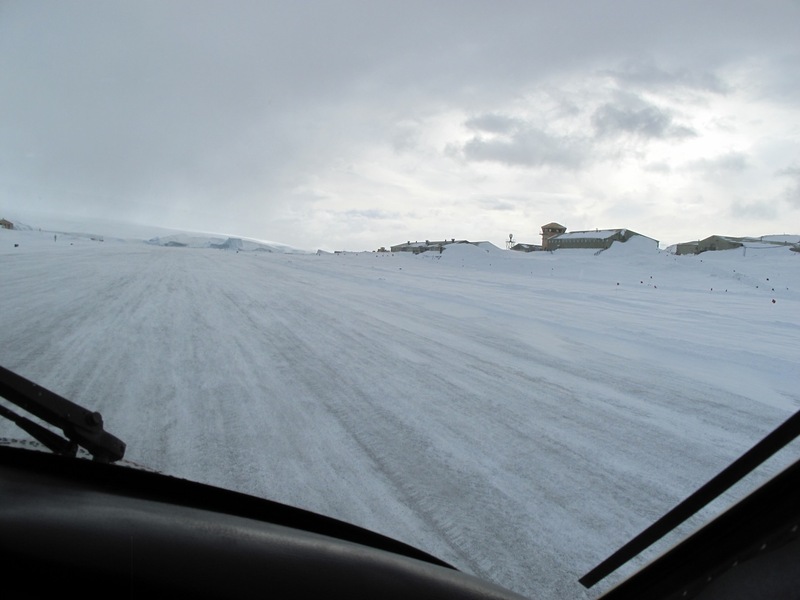 True to forecast, the storm broke upon Rothera just as we were landing. Within minutes, we had 50-knot winds and clouds of blowing snow everywhere. Dragging our gear back the short distance to the base was far more arduous than the real work on Scar Inlet. This evening, the wind is howling, ice-choked waves are crashing against the coast, and the building is shaking (60-knot gusts, I’m told). But we’re in the pub, enjoying the events of the day. And fearing the walk back to the dorm building. 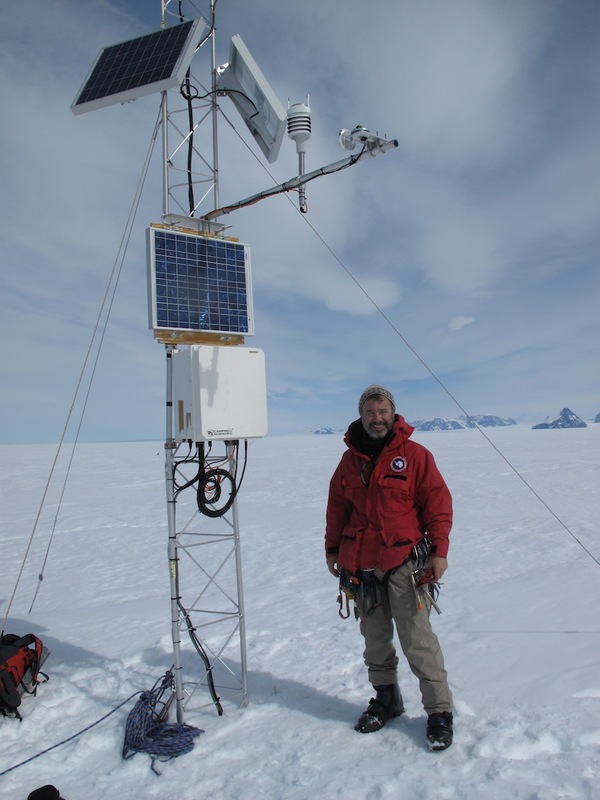 Malcolm Airey replaces the weather measurement system in the AMIGOS station on Scar Inlet. Photograph courtesy Ted Scambos. The airplane takes off from Rothera Station on the Antarctic Peninsula. Photograph courtesy Ted Scambos. Malcolm Airey works on the AMIGOS station at Scar Inlet. Photograph courtesy Ted Scmabos. 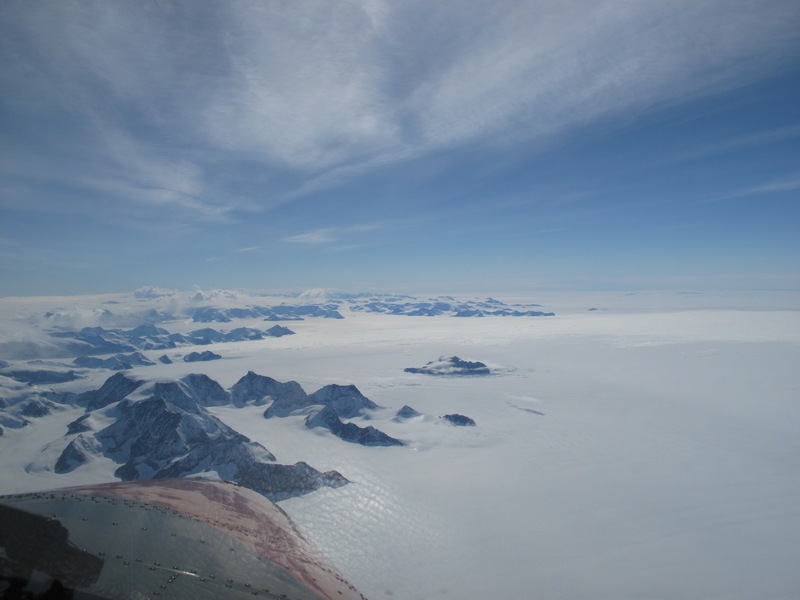 The Larsen C Ice Shelf lies to the south of the Larsen B, where weather conditions remain cooler. 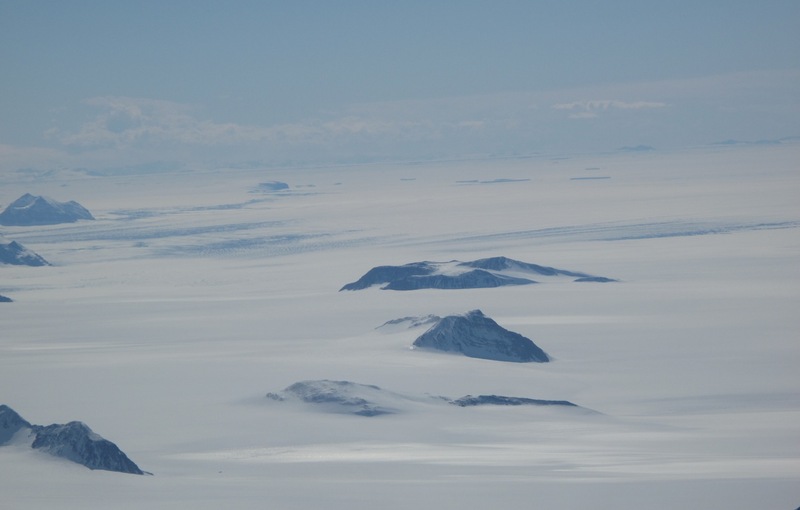 CIRES researchers Konrad Steffen and Dan McGrath are currently at the Larsen C doing field research. Photograph courtesy Ted Scambos. The Larsen B ice shelf experienced a huge collapse in 2002–this photograph shows the remaining portion. Photograph courtesy Ted Scambos. Scar Inlet. Photograph courtesy Hilmar Gudmundsson. 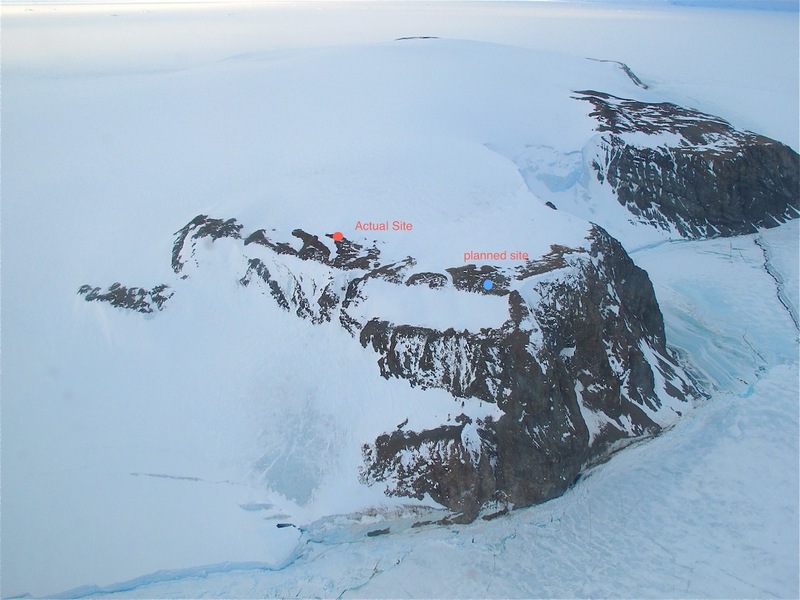 This aerial photograph shows the researchers hard at work on the Scar Inlet AMIGOS station. 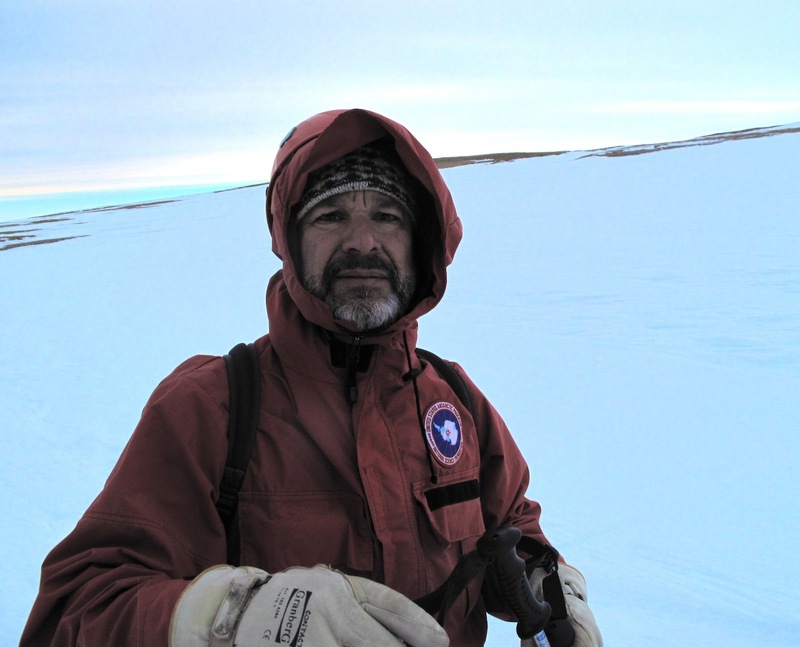 Photograph courtesy Hilmar Gudmundsson..
Ted Scambos smiles after completing work on the Scar Inlet AMIGOS station. Photograph courtesy Ted Scambos. On Saturday, weather again looked to be clearing over the area of our lost “Site Beta” AMIGOS station, as well as over the Larsen C, so I joined a flight that was planned for another group (Dan McGrath and ‘Puma’, a Chilean graduate student) to get an overflight of our last unvisited site. 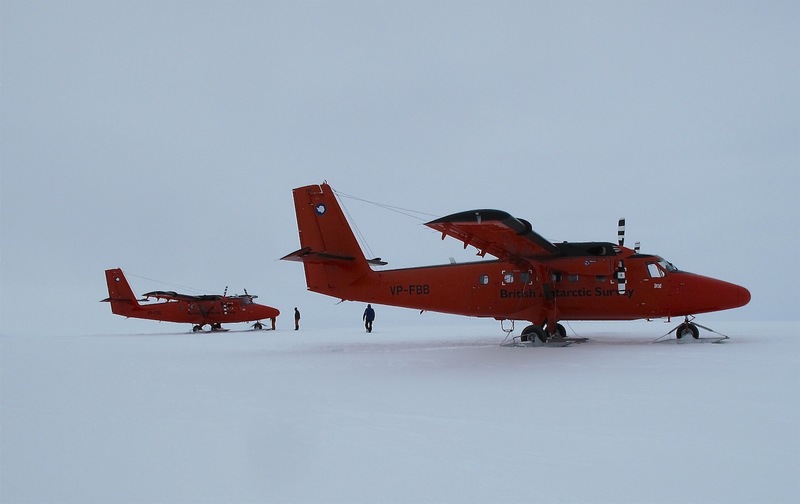 The flight included the chief pilot for BAS/Rothera, Alan Meredith, and several BAS staff hands, Ben Tibbetts and Ian, to assist with the main objective, raising a Larsen C AWS station managed by Dr. Koni Steffen (also of the University of Colorado) higher to keep it from suffering the same fate as Site Beta. The difference is that the Site 108 AWS received about 2 feet of snow since last year. Site Beta received 30. 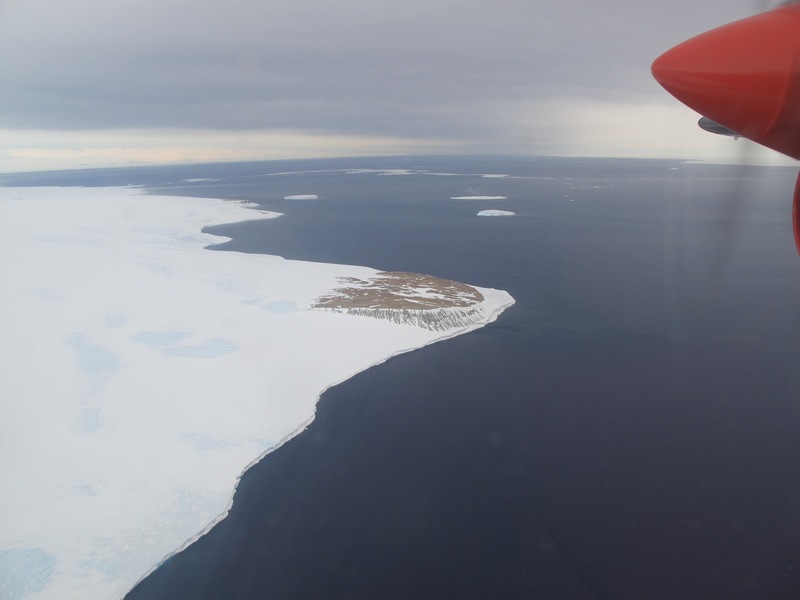 As we left Rothera behind us, we could see clearing ahead, and soon we were flying over the crest of the Peninsula. But below us the situation still was not good. Long streamers of blowing snow trailed off the surface, and from every rocky ridge. 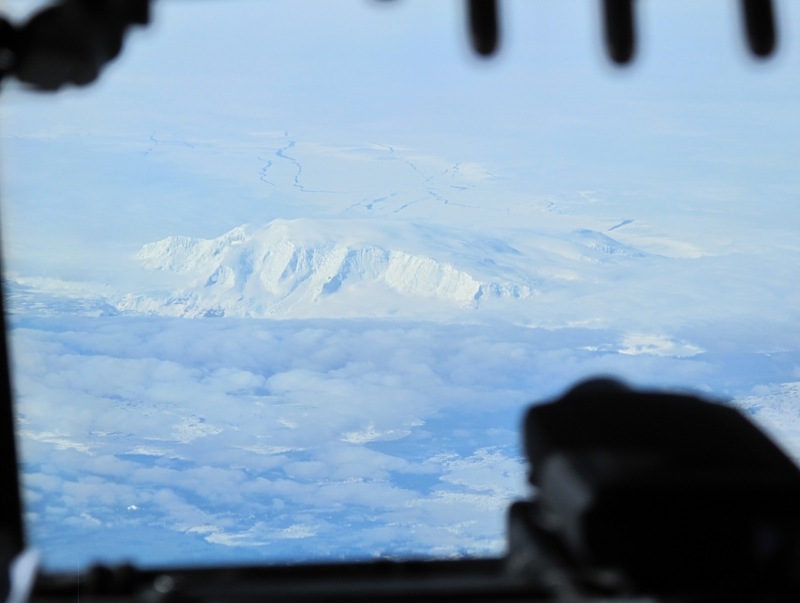 As we turned, I could see that the snow was moving about half the speed of the plane–and the plane was moving at 120 kts. Alan turned to me and said, “I’m sorry Ted, it’s just not going to happen.” I had to agree. We were still 20 miles from the site, and already there were low clouds building in addition to the snow streamers. The plane turned east, and landed a short while later, in surprisingly calm air on the eastern side. 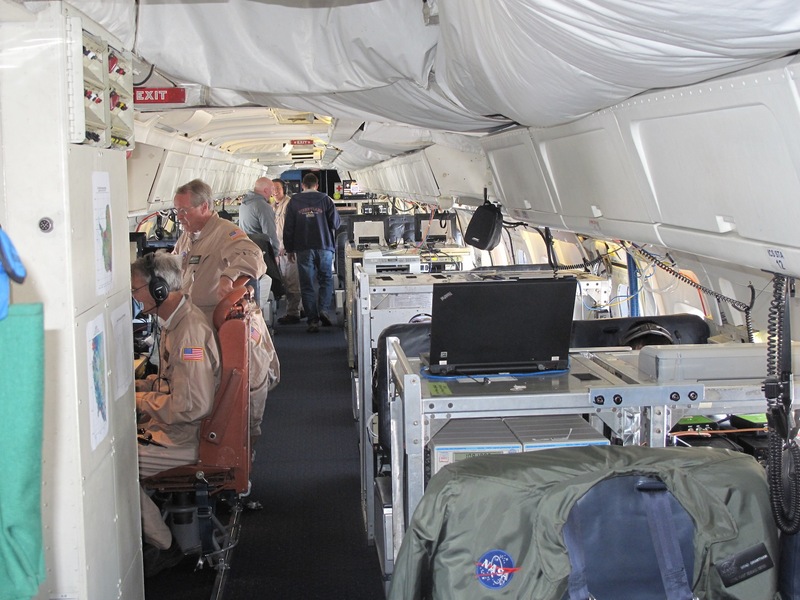 “That turbulence we passed through on the way down,” (it was just a bit of bumpiness) “was the shear layer in the air. 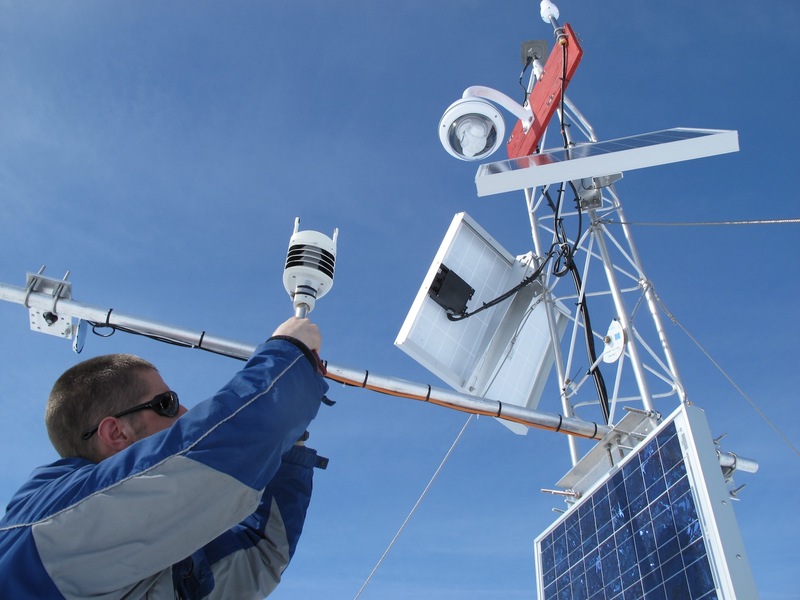 The high winds are above us now.” We spent the afternoon refurbishing a full weather station, raising it 3 meters higher so that it will survive at least 3-4 more years. The team headed north on Sunday, November 21, arriving in PA around 6 pm. We’re now en route home, just in time for Thanksgiving, with several repaired stations and a plan to return next year. The LARISSA AMIGOS Team of 2010/2011 wishes to thank AGUNSA, NSF, and especially BAS in Rothera for the excellent support we received, and for pitching in to help when needed. 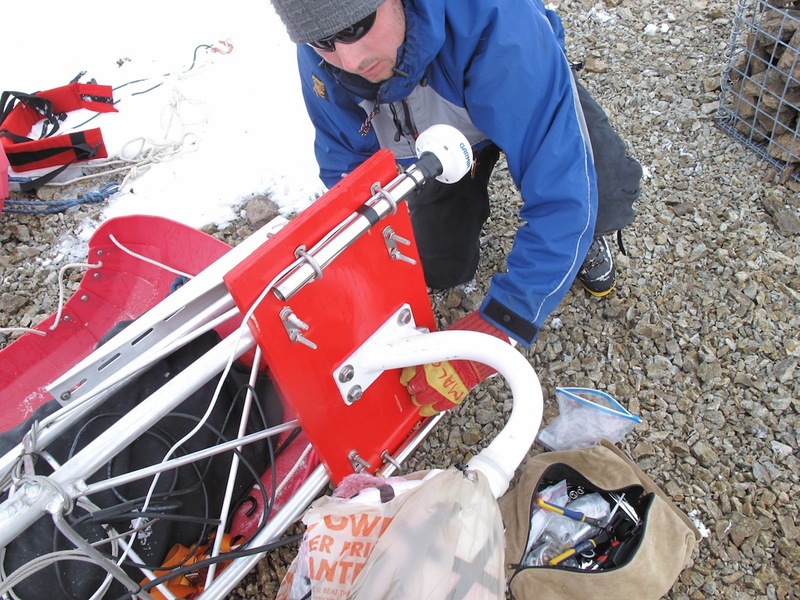 Dan McGrath, graduate student of Konrad Steffen at the University of Colorado, led the repair effort. 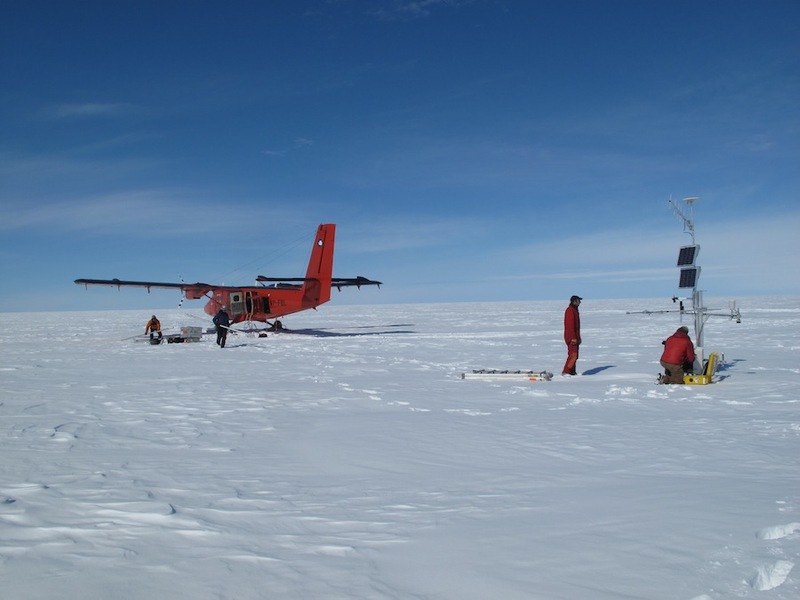 Clear weather finally prevailed on the morning of November 18, and after one last check of satellite imagery, we bolted at noon in our 1970s-vintage DeHavilland Twin Otter (with brand-new instruments and engines) off the runway at Rothera, headed for the Larsen Ice Shelf. Aboard were myself, Martin, and Jenn, BAS pilot Doug Cochran, and a BAS staffer named Andy “Boat” Wilson – known as Boat because he is a diver and a boatman for the base, and a sturdy guy to have along. 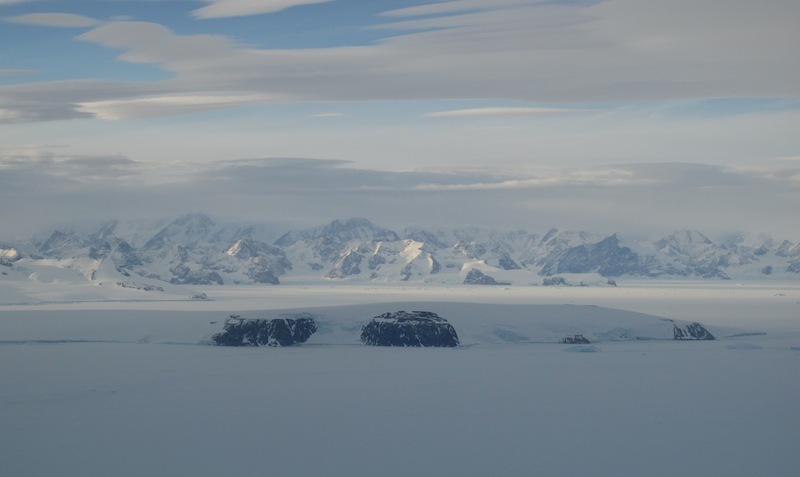 A few puffs of grey cloud passed by on our way upward, but then gave way to one of the most glorious spectacles in glaciology: the Larsen Ice Shelves and the eastern coast of the Antarctic Peninsula. Spilling ice from the ridge, which sits in the southern storm track building snow, flows down like marshmallow cream through black, jagged peaks, and then spreads out to an impossibly flat, broad sheet of ice. Only the subtlest of rolls and ridges mark the history of the bending that the ice endured to reach the sea. What we saw confirmed what we’ve learned from the data streaming in from the AMIGOS and other stations. 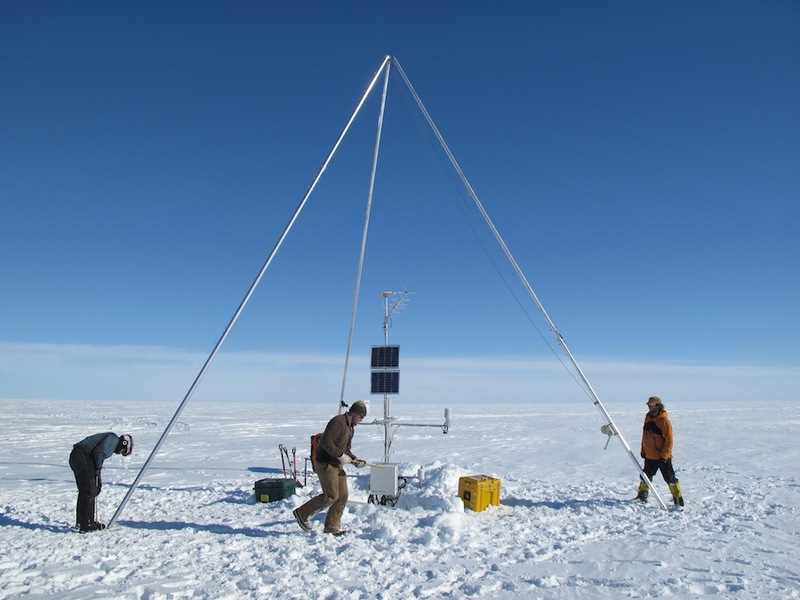 While the west side of the Peninsula has experienced unusual snowfall, the east side, where our stations are, has been bone-dry and very warm all winter. Already there are melt ponds slowly filling, and the dry warm wind has scrubbed the surface down, exposing every crack and ridge. cracks and slots. The pilot circled several times, determined to give us a landing if there was any chance; but the risk of bending a ski on the airplane was too great. We did manage to get several pictures of the site, and in some ways the news is good. The station is still standing, and with the anchors still firmly in place. 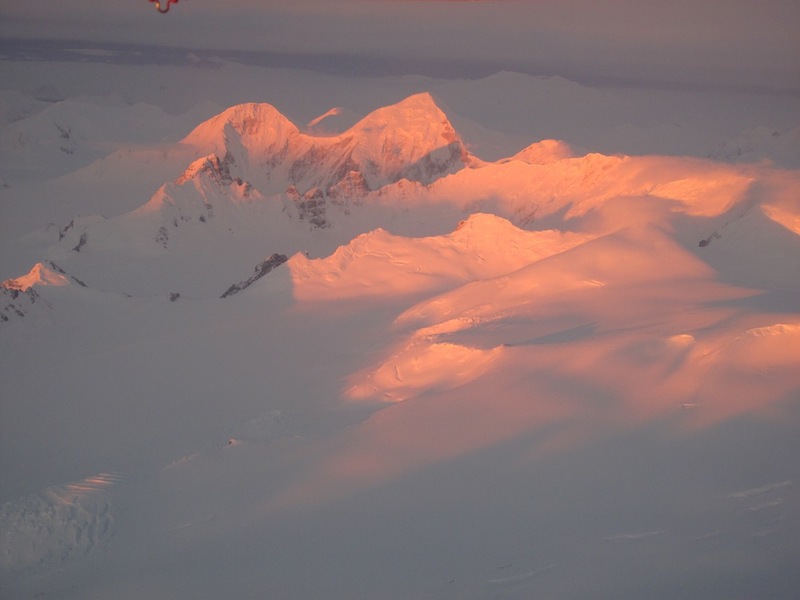 We then flew up the first major glacier feeding the Scar Inlet Shelf, Flask Glacier. A second AMIGOS there is working very well, but needed new software and a new snow reflectivity sensor. We use the snow reflectivity to gauge when melting occurs: the snow darkens quite a bit when it is wet. The landing went perfectly; right on the tracks from last year, and Doug pulled the plane right up to the station. The wind was brisk, but warm, right about at freezing. The station has about 70 centimeters of snow around it, but it is an oddity–everywhere around it is evidence of windswept snow surface. While we were standing there, the camera came to life! It moved to the six set shots that Terry had programmed in months ago. I tried to remember the sequence, and started leaping around in the snow, trying to get in every picture. But the camera was too fast. So, in every one of those pictures, one second later, I’m standing right there smiling. Martin, Mr. Smarty-pants, let the camera come to him, by standing still, and Jenn just shrugged and kept working. 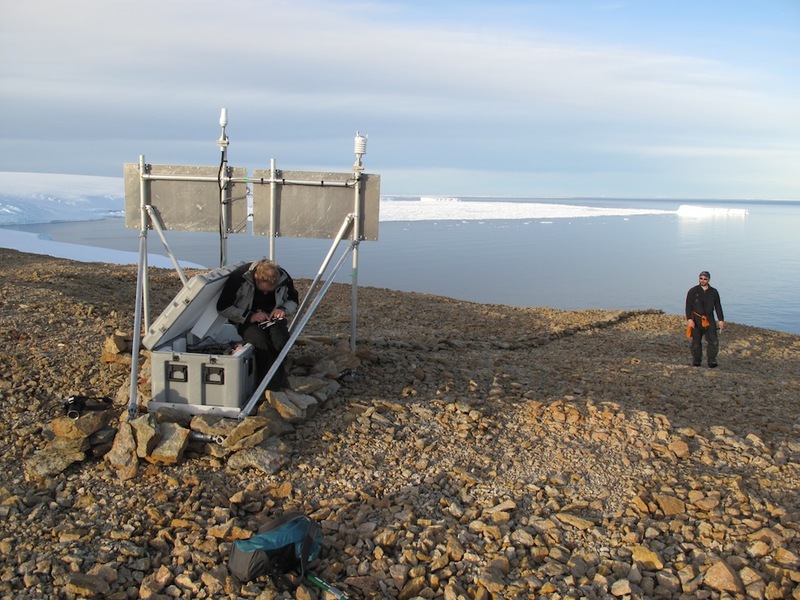 Jenn and I opened the station and changed the software chip, while Martin removed the old snow sensor and installed the new one. A quick call to Terry confirmed it was all working again. We took off. 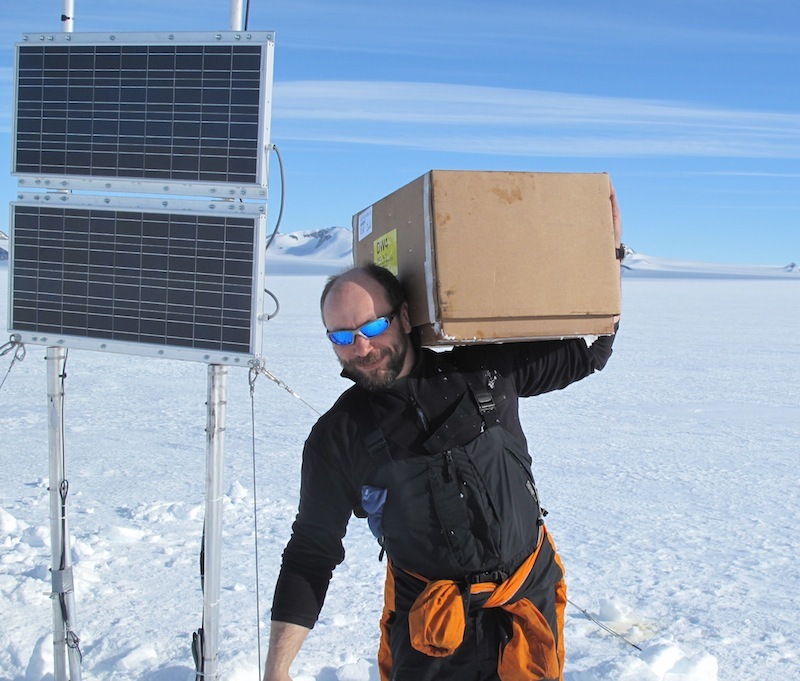 Martin’s main goal was to repair the GPS station on Leppard, and that was our next stop. Here again, the dryness and warmth of the winter and spring amazed us. There were crevasses and even melt ponds all over the glacier. We found the station, and as we had guessed, the solar panels had blown over during the winter. We had expected a major digging effort, but in fact the panels were just below the surface. It required about two hours to excavate them, stand them up again, and re-secure them. On the sat-phone again, the UNAVCO office confirmed we had a working station. Next! It was getting late, now, the sun definitely lower as we rounded a cape on the ocean and approached the rusty-looking outcrop at Cape Framnes. Here Doug really had a challenge. None of us had seen this site before, and it was steep, icy, and loaded with narrow cracks. The outcrop was perfect for helicopters, deadly for an aircraft. We made three different low approaches, each one ending with some new Scottish swearing (Doug is from Glasgow), and a proper decision not to touch down. We eventually found a site 2.5 miles and 400 meters above our outcrop. Martin, Andy, and I hopped out, grabbed ice axes and the new satellite modem, and started hiking. It was beautiful now, light winds, cool and refreshing, and we were walking downhill towards a stunning seascape. Walking and walking. The last 400 yards before the rock was a windswept blue ice surface, slick enough so that footing was tricky, but then we made it onto the rock. The outcrop had a blasted appearance, shattered fragments covering a primeval surface of lakes, sand, gravel, boulders nestled between blue ocean, turquoise sunset sky, and pale blue ice. Truly: an end of the earth, and a spectacular place to be. The fix went quickly, and we paused to take in the surroundings before the hike back to the waiting plane. I want to take this opportunity to thank the people at Rothera and British Antarctic Survey. At every step they have been generous, helpful, responsible, and eager to see us get our work done. I especially want to thank Doug Cochran, who did an outstanding job of piloting, and made the right decision on every single landing and attempt (IMHO). He pushed for our success, but never lost sight of the far more important safety decision. Andy “Boat” was a ready, cheerful helper for whatever we had to do (and he practically dragged my lifeless body up the hill after Cape Framnes, after a very tiring, hugely successful day.) 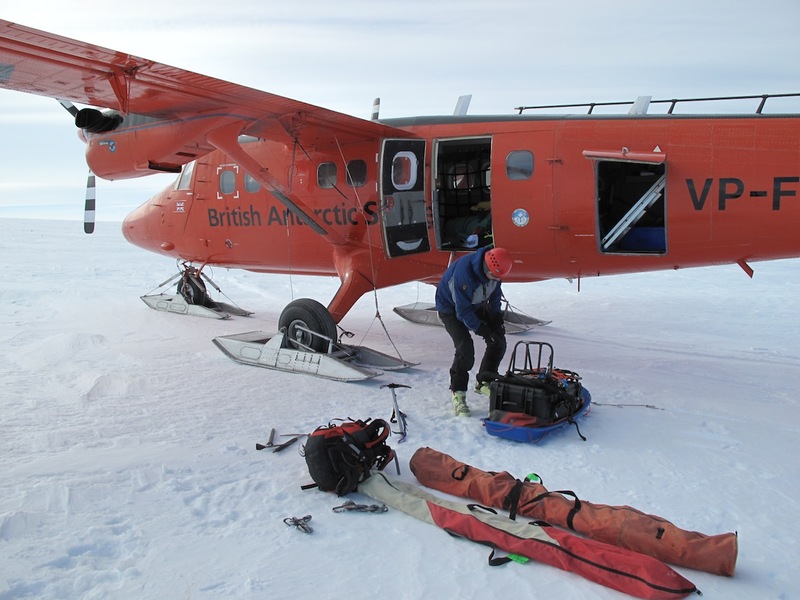 And, when we finally flew into to the Rothera hangar, at 20 minutes to midnight, both Clem Collins (a veritable institution at Rothera) and Andy Barker were there to help get the plane in and unload our gear. Thanks. 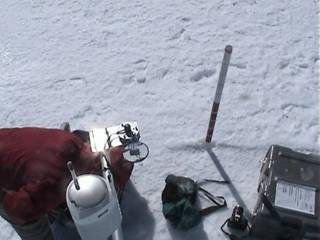 Ted, Martin, and Jenn work on the AMIGOS station at Flask Glacier. Ted, Jenn, Martin Truffer, and two BAS Twin Otter pilots traveled to Flask Glacier this morning to service AMIGOS-3. I got a call from Jenn at 9:55 this morning, and AMIGOS-3 took the attached images about 10 minutes later. 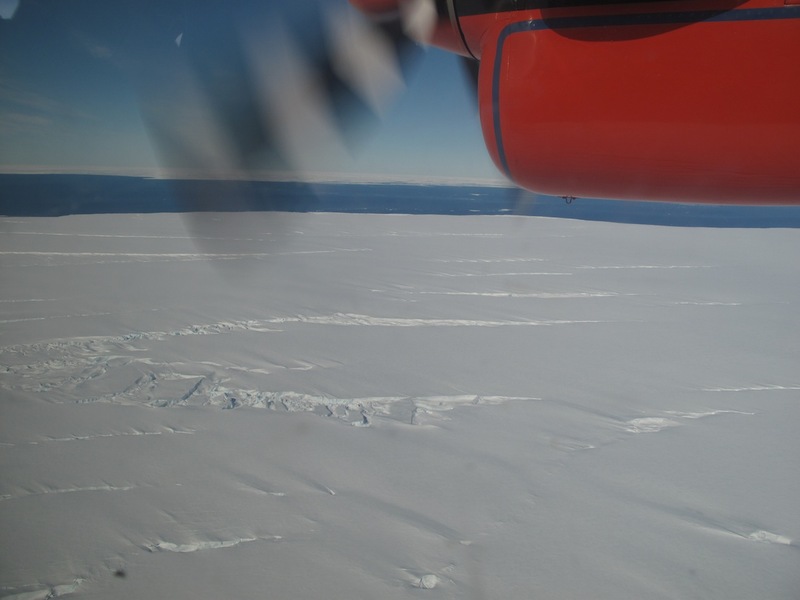 They had made a pass over AMIGOS-2 at Scar Inlet on the remnant Larsen B ice shelf on the way in, but the pilots decided that the surface was unsafe for landing. 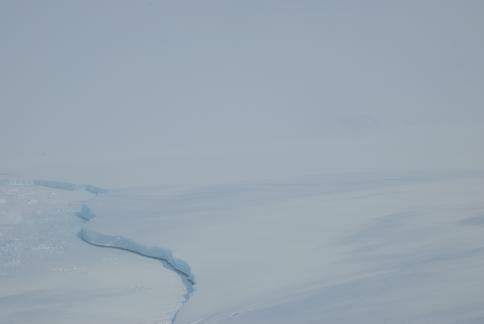 The recent warm temperatures have exposed many previously snow-covered crevasses near AMIGOS-2. I got call from Ted at 10:35. He finished the AMIGOS-3 repair and testing of the downward-looking albedometer sensor. I have also verified in the data we received in the last few minutes that the repair was successful. 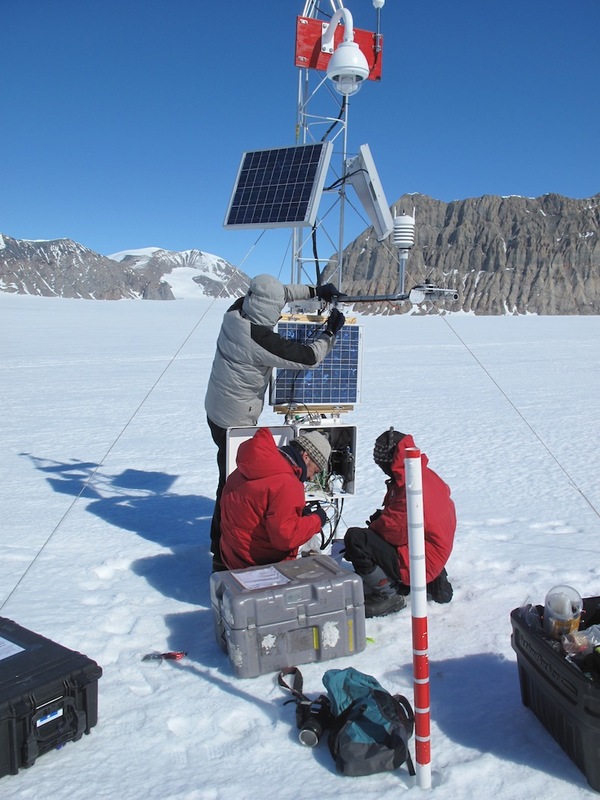 Next, the team is heading to Leppard Glacier to repair the GPS unit there. 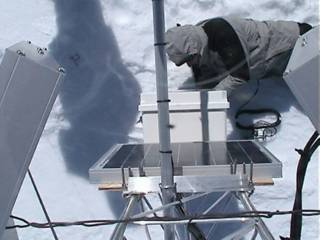 Another photo by the AMIGOS station shows a grey-clad researcher working on the station. 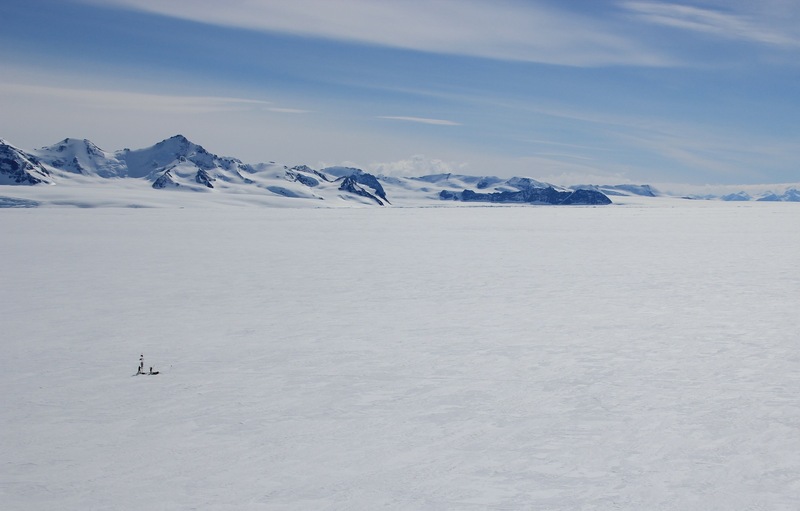 This image, from AMIGOS-2, looks up Flask Glacier towards where the researchers were working on AMIGOS-3. Crevasses are visible near the right, bottom, and left edges of the image.